In its life before Tropical Storm Ivan, Somewhere West was called Caribbean Dream, a name that expresses the unique seaside beauty of our property. Being our own personal Caribbean dream come true, it's our pleasure to share it with guests. Somewhere West offers suites with heavenly vistas of the Caribbean Sea. Located on the Deep West End of Negril, Somewhere West maintains an off-the-beaten-path yet central location to well-known locales such as Rick’s Café and Seven Mile Beach. 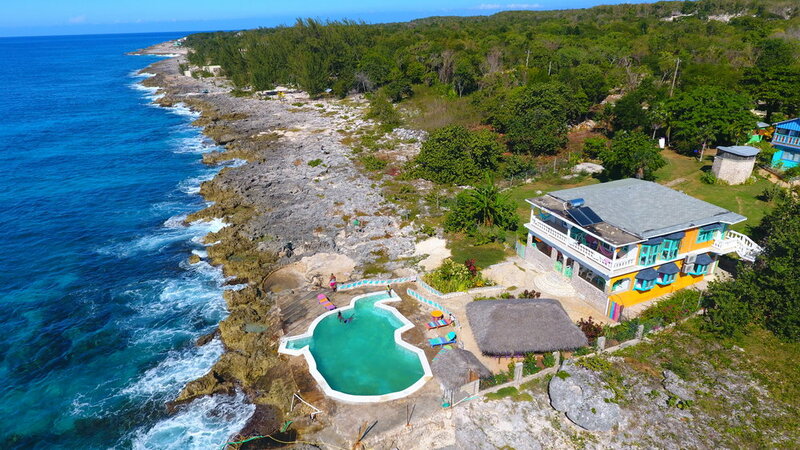 Unmatched sea and sunset views, bright and colorful decor, a wave-crashing saltwater pool and an outstanding chef differentiates Somewhere West from all other Negril guesthouses. What’s most special is the “Mom and Pop” family vibe, our six friendly rescue dogs and our warm and accommodating staff. In 2013, the current owners of Somewhere West began putting back the pieces of what was left behind by the wreckage of 2004’s Hurricane Ivan. With the financial assistance of her father, native New Yorker, Angela Eastwick and her Jamaican partner, Jermelee Limoth, set out on the project of a lifetime. Caribbean Dream was in dyer straits. Only one structure was worth renovating; a white and green two-story seaside building which now serves as the property’s brightly colored guesthouse. It was essential that all windows, doors, flooring, bathrooms, kitchens and furniture be replaced, and without having prior experience in the construction field, initial renovations proved to be a major struggle for the young couple. Eventually they met an experienced contractor who not only helped the couple clean up the mess but taught them valuable lessons in building. Within a year and a half, four apartments had been fully renovated, a saltwater pool built and the construction of an owners’ house had begun. They decided to call their new and improved place "Somewhere West". In 2017, the couple opened a bar and restaurant on the property, Nourine’s Kitchen, named after Jermelee’s late mother. Today, the restaurant is an active meeting place for both locals and tourists.